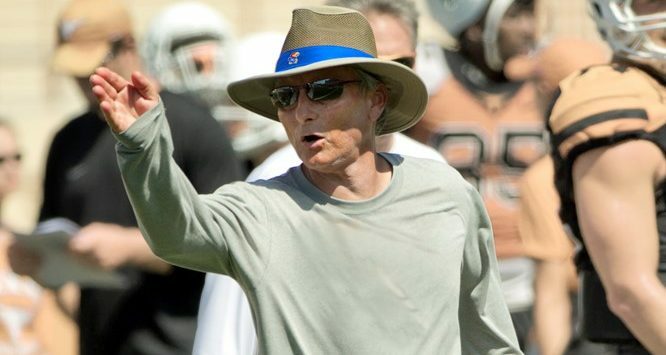 LAWRENCE, Kan. – Kansas football head coach Les Miles hired a coaching veteran with more than 38 years of experience, as he tabbed Les Koenning to coordinate the Jayhawks’ offense. Koenning, who has 17 years as an offensive coordinator, has produced game-changing offenses and record-setting players at Power Five programs Mississippi State (2009-13), Texas A&M (2003-07) and Alabama (2001-02). Koenning comes to Kansas after spending the 2018 campaign at Southern Miss as running backs coach. His year at USM follows a two-year stint as UAB’s offensive coordinator, where he led the Blazers offense in its first year back after a two-year hiatus. UAB was fifth in Conference USA in scoring and rushing offense during the 2017 season. Quarterback A.J. Erdely set the UAB record for rushing touchdowns in a season by a quarterback with 13 and freshman running back Spencer Brown set the freshman school record for rushing yards with 1,329 yards and was named C-USA Freshman of the Year. Prior to his arrival in Birmingham, Koenning served as wide receivers coach at the University of Texas in 2014. In his lone year with the Longhorns, Koenning guided John Harris to all-conference recognition as Harris hauled in 68 catches for 1,051 yards and seven touchdowns. Prior to joining the Texas staff, were Koenning’s five seasons in Starkville. He came to MSU from South Alabama, where he spent 2008 helping to establish the foundation for the newly developed Jaguars program that began play in 2009. Prior to that, Koenning spent five years on the Texas A&M staff, serving as offensive coordinator and working with the quarterbacks. During his time there he oversaw the development of both Reggie McNeal and Stephen McGee. McNeal set a then single-season school record with 2,791 passing yards in 2004, while McGee put together two seasons that ranked in the top 10 at that time in 2006-07. McNeal also finished his career as Texas A&M’s career passing leader with 6,992 yards, in addition to rushing for 1,889 yards, while McGee left in fourth place with 5,475 passing yards combined with 1,750 rushing yards. Both players would go on the be drafted with McNeal selected in the sixth round of the 2006 draft by Cincinnati, and McGee chosen in the fourth round of the 2009 draft by Dallas. Seven other Aggies were also drafted who played under Koenning. Koenning went to Texas A&M from Alabama where he was offensive coordinator and quarterbacks coach for two seasons (2001-02). Alabama split time between Tyler Watts and Andrew Zow in 2001, however Ahmaad Galloway led a rushing attack that ranked ninth in the nation (226.4 ypg). The 2002 team ranked 18th in rushing (213.2 ypg) while posting a 10-3 record. Shaud Williams and Santonio Beard carried the load with 921 rushing yards and 811, respectively, while Tyler Watts and Brodie Croyle shared time at quarterback. Center Alonzo Ephraim was a two-time First Team All-SEC honoree in the two years. Before Alabama, Koenning spent one season as passing game coordinator and quarterbacks coach at TCU in 2000. He was the offensive coordinator at Houston in 1999 and Duke in 1998 following a one-year stint in the NFL as an offensive assistant with the Miami Dolphins. Koenning had also served previously at Texas A&M as wide receivers coach from 1994-96, and he briefly held the same position at Duke in December of 1993 after also coaching wide receivers at Rice from 1990-93. His first experience at Mississippi State came from 1986-89 as running backs/wide receivers coach. A native of Houston, Koenning began his career with graduate assistantships at Texas and Alabama, before being named wide receivers coach and recruiting coordinator at Louisiana- Lafayette in 1985. He graduated from Texas in 1981 with a degree in health and physical education, and added a master’s degree in sports management two years later. He played at Memorial High School in Houston for his father, Les Koenning Sr., who was a longtime Texas high school and college coach.